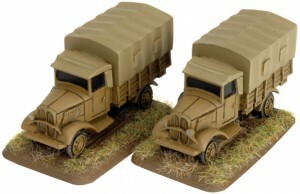 Battlefront is featuring the Isuzu 1.5 ton truck for Flames of War over on their website. Before the outbreak of World War Two, the Imperial Japanese Army (IJA) lacked a reliably truck capable of cross-country operation. Upon investigating the types commercial trucks available at the time, the Isuzu medium truck proved adequate for the Army's requirements. First introduced in 1937, the Isuzu 1.5-ton truck was the most widely used trucks of the Imperial Japanese Army up until the end of the Second World War.